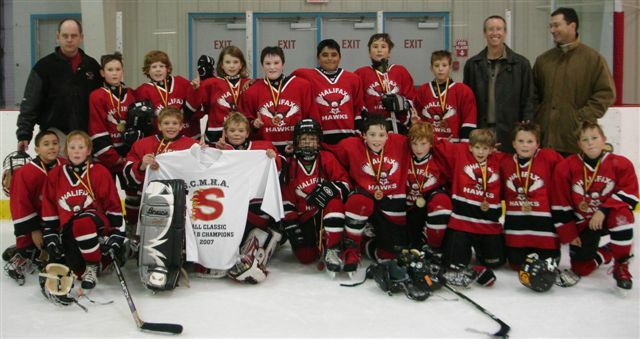 November 12, 2007 - -- Well what a weekend we have had as a team! This past weeekend we loaded car after car and kid after kid off to the southshore to play in the Shelburne Fall Classic and what a time we had. We started the tournament off with two wins on Saturday, 9-1 against Shelburne and 9-1 against Liverpool BB. Then we capped the night off with some fun and pizza in coach Jamie's room and coach Kerry's rooms. After all of that the kids headed outside for a little snow ball fight.......whatelse do you do when you are in Shelburne and the snow is falling......On Sunday the kids got up to play two more games.....our first game was at 10:30 against the Liverpool B team who were undefeated like us.....after playing a really tough game we did end up losing that game, but after a 30 min drive to the other rink for the Championship game the kids dug down deep and with the help of some phenominal goaltending, great skating, hard work and huge determination, they rose to become the Champions of the tournament by defeating the Liverpool B team 3-0.